“As a child, I would play a game with myself where before I got up, I had to first erase the shadows on the wall. I invented an invisible paintbrush to paint over the shadows of the windowsill or the lamp or whatever was there. It became like an obsession. For me, looking at the world has always been connected to doing something in it, on it, or with it at the same time. Painting facilitates the synchronicity of acting and thinking in the most amazing way because there's no transmitter between the tools and me. A painting is simply a screen between the producer and the spectator where we can both look at the thought processes residing on the screen from different angles and points in time. It enables me to look at the residue of my thinking”. 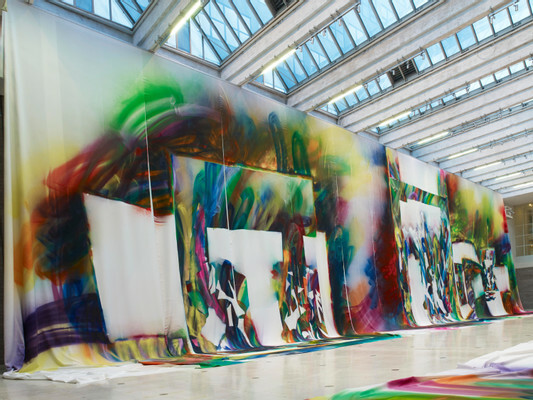 German artist, Katharina Grosse (born 1961) paints monumental tableaux of desire that can be perceived as a sublime act of lovers' embrace towards the space, an architecture and the viewer. For the National Gallery in Prague, Grosse elaborates a large-scale, site specific painterly installation which radically redefines painting as a performative and architectural medium and responds to the Gallery's industrial space of the late 20s functionalist style. 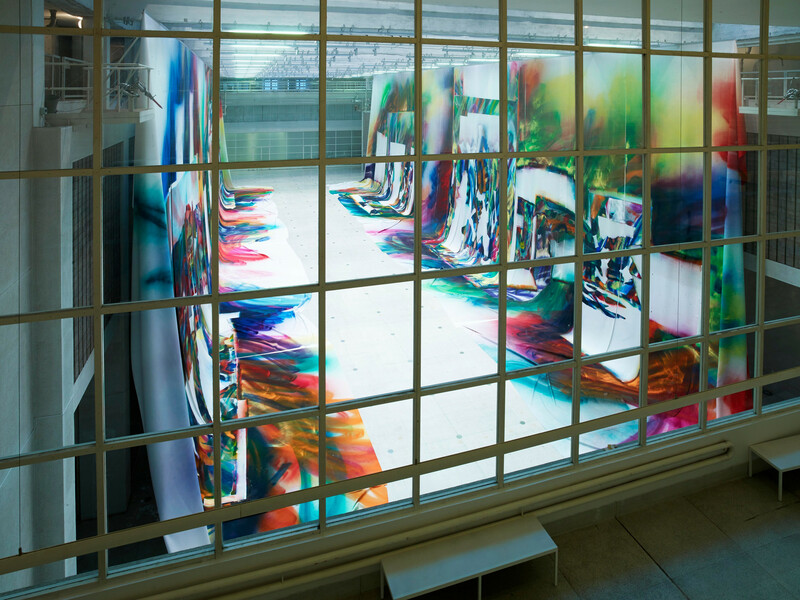 Her “Wunderbild” is an architectural painting, a spatial image which the viewer inhabits with his/her body and mind. The color gains a volume; the flat surface turns sculptural; the pictorial field crosses the limits of the visual. Epic in scale, immersive installation reminds of both a medieval mural and a womb-like cave of a pre-ancient drawing, a post-theatrical chamber of a hyper-technisized, intoxicating environment. 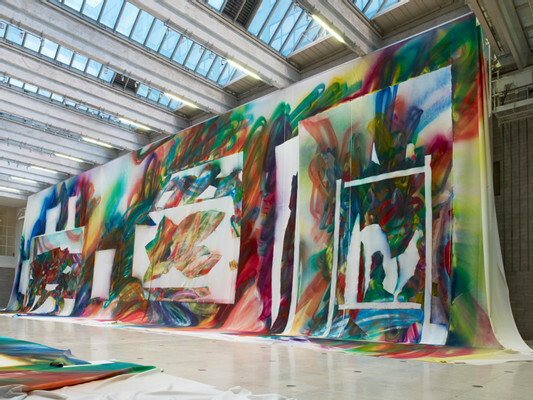 The painting takes over the site; Grosse’s gesture is an art of becoming a space. “I’m a painter - the artist confesses - I’m interested in the space generated by the painted image and how it can appear in any kind of existing field, be it architecture or the mundane situations of everyday life. For me, painting isn’t restricted to a canvas or a wall”. According to Grosse, the painting is an unconstrained act of freedom. Her “Wunderbild” in the National Gallery in Prague is an outburst of pictorial generosity. Registering a gestural moment of image’s appearance, it perceives painting as a processual practice of an extreme resilience and flux, a life itself, a mental and physical preoccupation. Additionally, Grosse is conceiving an intervention on the threshold between the architecture and the natural environment, outside of the Gallery. In both cases, the artist creates an autonomous space, defined by color and form, a post-romantic landscape of a subjectivity and nature in ruins. 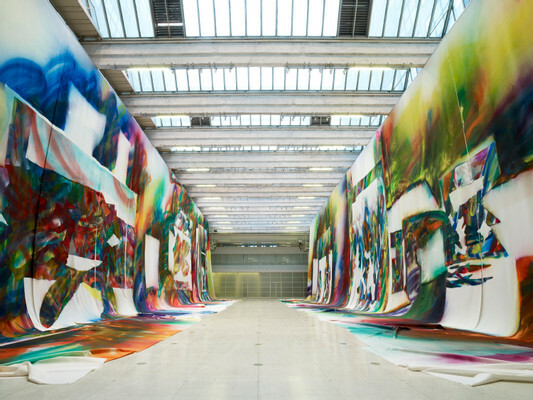 As such, monumental installations of Katharina Grosse can be situated in-between the American Land Art movement and the late 19th century German romanticism. Occupying liminal territories of an interior (institutional space) and an exterior (public space), and often integrating natural materials (trees, rocks, soil, etc. ), her often large-scale architectures are hybrids that reach beyond the divide of nature and culture. They create a space of co-habitation of human and non-human, organic and non-organic, the natural and the artificial, leading towards a subjective anthropology for a world in an ecological decline. Katharina Grosse was born in 1961 in Freiburg, Germany, and now lives and works in Berlin. She studied at Kunstakademie Düsseldorf, Germany, and Kunstakademie Münster, Germany. Since the late 1990s, Grosse has worked almost exclusively with industrial spray guns in lieu of brushes, applying vibrant fields of atomized acrylic to virtually any available surface. “I use all sorts of tools - Grosse explains her method of working - from my hands to my fingers to tiny brushes to rough household bristle brushes or rollers. I like to get in direct contact with the surface. With the spray gun, it is in the air, off the surface, loose. It shoots paint through the air with air like a 3D paint machine body­ wired to my brain. The spray gun got my attention exactly at the time when I wanted to begin painting on multi­dimensional surfaces. The paint supply of the loaded gun is incredibly generous and the air pressure amplifies your reach and accelerates your movements. This means I can make more happen in less time. It really is like a synthetic organ that can touch and encompass space and shrink distances. The infinite line. The expanding body. It allows me to approach situations with enormous thrust and positive aggression”. Katharina Grosse’s work has been featured in international solo and group exhibitions, as well as major arts projects and biennials. Her most recent site-specific installations include Rockaway! for MoMA PS1’s “Rockaway!” program (2016), Untitled Trumpet for the 56th Biennale di Venezia (2015), and psychylustro, Mural Arts Philadelphia (2014). Notable solo exhibitions include “Constructions à cru,” Palais de Tokyo, Paris (2005); “Atoms Outside Eggs,” Serralves, Museu de Arte Contemporânea, Porto (2007); “Hello Little Butterfly I Love You What’s Your Name,” ARKEN—Museum for Moderne Kunst, Copenhagen (2009); “Two younger women come in and pull out a table,” De Pont Museum of Contemporary Art, The Netherlands; “WUNDERBLOCK,” Nasher Sculpture Center, Dallas both (2013); “yes no why later,” Garage Museum of Contemporary Art, Moscow (2015); Museum Frieder Burda, Germany (2016); “This Drove My Mother Up the Wall”, South London Gallery (2017); the Schwartz Carriageworks, Sydney (2018). Katharina Grosse's exhibition in the National Gallery in Prague is accompanied by a publication with contributions by Chantal Mouffe, Elisabeth Lebovici, Michal Nanoru and a curatorial introduction by Adam Budak. The exhibition is held under the auspices of the Embassy of the Federal Republic of Germany in Prague and with the support of the Goethe-Insitut in Prague.